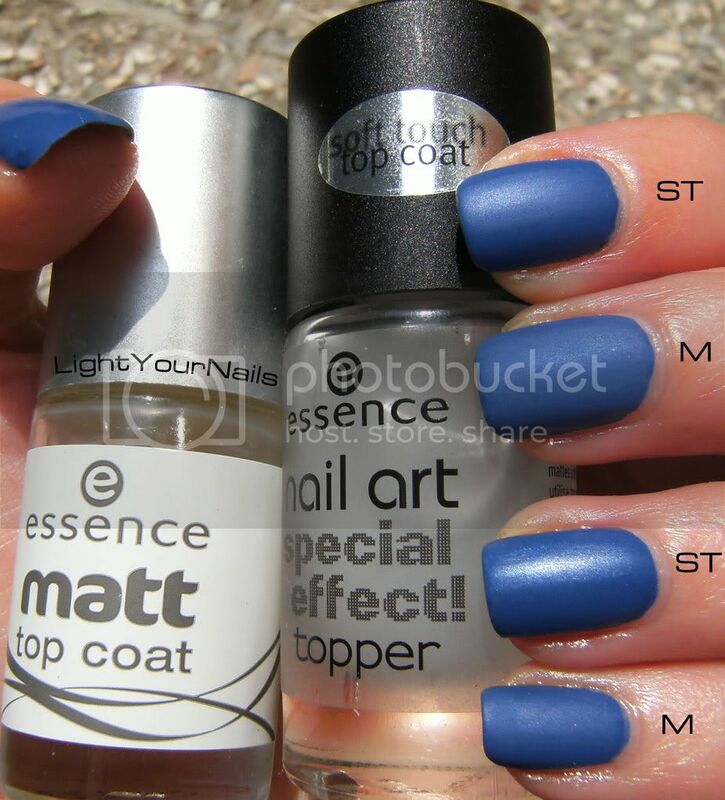 Essence Matt vs Soft Touch Top Coat | Light Your Nails! 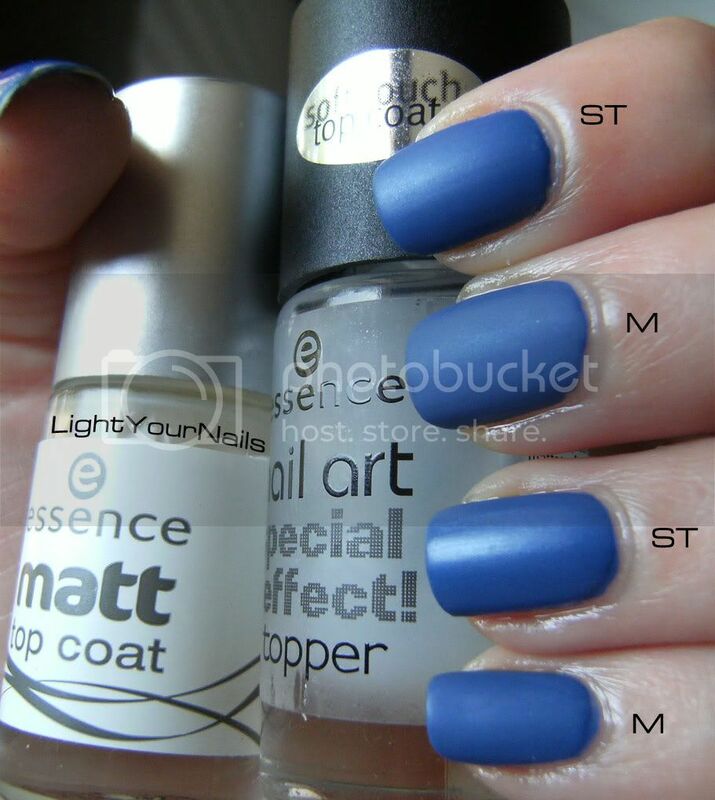 As promised to some of you in the comments to my last post here it comes a comparison between Essence Matt Top Coat and Essence Nail Art Special Effect! Soft Touch Top Coat. Let me first say that my bottle of the matte TC is now discontinued, I know there’s still a matte TC but it might look different. However I think the Essence matte TC is the same as all the standard matte TCs of any brand. I know Elf and NYC are easy to find, cheap and do their job for example. The Soft Touch top coat however was a nice surprise for me. I received it by winning a competition with Essence Italy last December. I would have never bought it otherwise because I was sure it was a standard matte top coat. How wrong! The soft touch as you saw in my last post has a satin finish that works great especially on shimmer polishes because it doesn’t completely cover their finish. Come promesso a qualcuna di voi nei commenti al mio ultimo post, ecco un post per capire le differenze tra l’Essence Matt Top Coat e l’Essence Nail Art Special Effect Topper! Soft Touch Top Coat. Prima di tutto preciso che la mia bottiglia del TC matte è fuori produzione quindi quella nuova avrà probabilmente un nuovo look. In ogni caso il TC matte della Essence è paragonabile a quello di qualsiasi marca. Molto apprezzati ad esempio sono quelli della Elf e della NYC, entrambi validi e economici, nonchè facili da trovare. Il Soft Touch invece è stata una vera sorpresa. L’ho ricevuto per aver vinto un gioco sul sito Essence Italia a Natale. Non l’avrei mai comprato da sola perchè ero convinta che fosse un TC matte come gli altri. Errore!! Come avete visto nel mio ultimo post il Soft Touch ha un finish satinato, e non matte, e ha un bellissimo effetto specialmente su smalti shimmer perchè non copre del tutto il loro luccichio. Let’s see the difference, shall we? This is one coat of Essence Matt Top Coat on my middle and pimkie, and one coat of Essence Nail Art Special Effect Topper! Soft Touch Top Coat on my index and ring. Underwear for both is a blue shimmer polish by L’Oreal. Guardiamo le differenze? Questa è una mano dell’Essence Matt Top Coat su medio e mignolo, e una mano di Essence Nail Art Special Effect Topper! Soft Touch Top Coat su indice e anulare. Sotto a entrambi uno smalto blu shimmer della L’Oreal. In both pics you can easily notice that the polish is still kinda shiny with the Soft Touch top coat while the matte TC did its work by completely mattifying what was underneath. Come potete vedere facilmente in entrambe le foto le unghie con il Soft Touch rimangono lucide lasciando trasparire lo shimmer dello smalto originale. Invece il Matt top coat fa il suo lavoro coprendo tutta la lucentezza. Io li trovo entrambi validi prodotti ma per mio gusto personale preferisco l’effetto satinato. Voi che dite? Quale vi piace di più? That's for the comparison! I wasn't sure what the difference was. I would have to choose matte if I had to pick. I definitely think that's only a matter of taste because both products are really good! I actually can't decide, which one I like more. Both look nice, but I prefer glossy finish. I like them both, but if I had to choose I think I would buy the Matte one. I like them both, but my favourite is the Soft Touch Top Coat. So pretty. I like both, but Soft Touch I like a bit more :). Molto bello il Soft Touch, l'ho preso anch'io, non vedo l'ora di provarlo! Spero ti piaccia quanto a me! Second one to prefer matt! Ho aperto da poco un Blog, mi fà piacere se passi!